SAILS/AGE/CONDITION: Furling (around boom) main sail. Inner (furling) front stay sail. - Vetus bowthruster 75kg with 2 x joystick. + new holding tank 180ltr (2017). - HI-FI system (of 2018). RECENT MAINTENANCE records on request. 1 x fore cabin V shape. 1 x double bed + 1 single bed in dinning room. 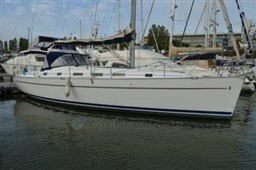 Dear Sirs, I have seen on YachtVillage your offer about Nauticat / Siltala Yachts Nauticat 44 - 1981 (code: 264500). I am interested in the offer and would like you to contact me. Thank you.